This week has been a busy one. I have a stack of items to be blocked, but because we’re moving things around the house, I haven’t had the free space to try out my new blocking wires. My current project is the Hitchhiker shawl. It’s a lot of garter stitch. A lot. But I’m enjoying it and haven’t wanted to cast on another project just yet. To make up for the lack of new projects to post about, I present a week in the life of the Hitchhiker in pictures. 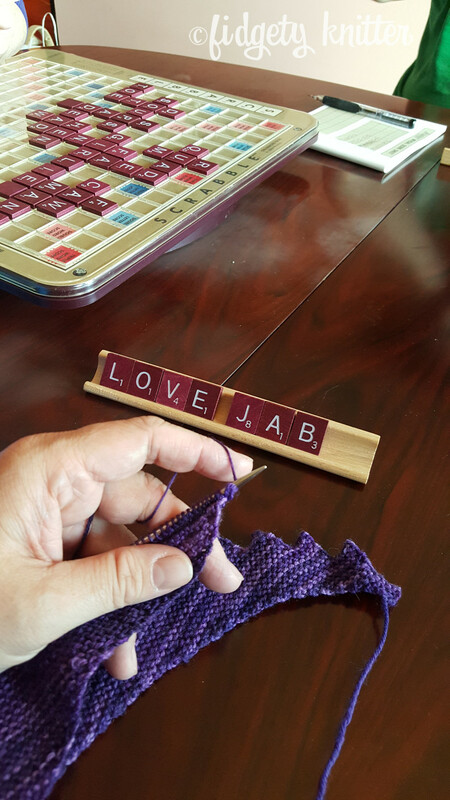 We start the week out knitting stitches in between rounds of Scrabble. I was doing well until my husband took over for my daughter. Then I lost. That’s what happens when you marry a man who spells really well. The next day, my son and I went to see Jurassic World. We got there early so of course I was able to knit up a couple of rows. Until the lights went down and it was me and the dinosaurs and a concerned looking Chris Pratt. I can knit without looking, but I don’t like to knit in the dark. Lights go down, knitting gets put away. Also, if you like high energy dinosaur movies, this is a must watch. Plus, Chris Pratt. Tuesday night was super fun. I had made a mistake in my knitting. It took several rows for me to noticed I had somehow purled a knit stitch. Being the confident knitter I am, I dropped the stitch about eight rows. Really it’s an easy fix. I thought I had it and kept going. And then realized that I had flipped all the stitches when I picked them back up. I knit the purls and purled the knits. Garter stitch is harder to fix than I thought. So I bit the bullet and pulled out about two inches of knitting. It’s fixed now but undoing, picking up the stitches and untangling my mess took all night. Do you have a group of knitters you meet with on a regular basis? I never did. Until last fall when I finally searched one up. We meet every Wednesday at a local Barnes & Noble for three hours of knitting/crocheting, coffee drinking and talking. These people are amazing and truly feed my soul. I can’t believe I waited so long to find a knitting group. It’s amazing to have people in my life who understand the tragedy of having to pull out my knitting or share in the thrill of buying a new yarn or trying a new pattern. Seriously, find a knitting group to join. My husband wanted my suggestions on a new haircut so I went along on a new salon visit. I could sit and read an old People magazine while he gets his hair cut. Or I could use that time to knit. That’s a no brainer. Do you follow me on Instagram? If you do, you probably know this view. I love movies and TV. There, I said it. I spend a lot of time sitting in my den, watching something new or catching up on some missed masterpiece on Netflix. Which is ALSO perfect knitting time. I take a lot of project pictures like this from my official movie watching spot. I try to always keep a knitting project in my purse. I pull it out when we’re in the car or if I find myself waiting. Sometimes when I’m meeting friends I’ll pull my knitting out. A simple job that I can pick up and put down and doesn’t require a lot of focus as I knit. Outside of “I love you,” I think my husband hears, “Here, hold this” more than anything as I hand him my project bag so I can dig through my purse. That was my week. Where have you knit this week?